If you want the quickest, most convenient and most flexible way to get from Sofia airport to SUNNY BEACH, BulgariaTransport.com offers door to door PRIVATE TRANSFER service directly to your accommodation at lowest local rates. Prices for private transfers from Sofia Airport to destinations such as Sunny Beach start at 199€ each way for the vehicle, when there are eight people travelling , which works out at less than 25€ each for a group of eight. Private return transfers for one to four passengers cost just 149€ per vehicle each way. Which works out at less than 37€ per person for a family of 4. Sunny Beach is a major seaside resort on the Black Sea coast of Bulgaria, located approximately 35 km north of Burgas and 430 km east of capitol Sofia. 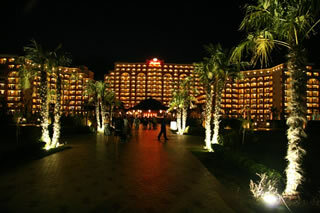 It is the biggest and most popular holiday resort in Bulgaria, and is home to over 800 hotels with more than 300 000 beds. There are over 200 restaurants and numerous live music bars, pubs, nightclubs, discos, cafes. It has been undergoing continuous expansion for many years. It is widely believed in Bulgaria that Sunny Beach was heavily overdeveloped in the 2000s to the detriment of its greenery, former serenity, safety, and the quality of public services. The main strip of high-rise hotels backing onto the beach is several kilometers long and extends along a wide bay between Sveti Vlas and Nessebar. Attractions for tourists include the sunning at the beach, water sports, great nightlife guaranteed by number of famous clubs and bars located in the complex and beach area. There are two new Aqua Parks near the resort. 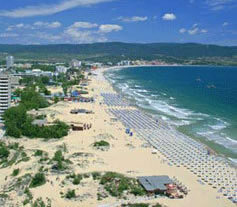 Sunny Beach is mainly popular amongst young people. The Golden Orpheus International Festival of Popular Song, the Decade of Symphonic Music, part of the International Folklore Festival, fashion-shows and various beach competitions are held there.